If your tote could talk, what would it say? This one whispers, "I'm so full of caffeine, I could carry these onions, books, and workout wear all day!" 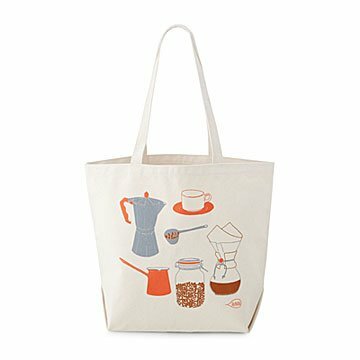 Its playful, subtly sophisticated illustrations of coffee beans and gear to brew them with—moka pot, glass pour-over coffee vessel, long-handled Turkish coffee decanter, and mason jar full of roasted beans—are drawn by hand on 100% cotton canvas. Market-sized, it’ll hold your entire farm stand haul. Sturdy handle straps and a flat bottom make it easy to carry, and non-tippy when you set it down to chat with the farmers—or the barista.